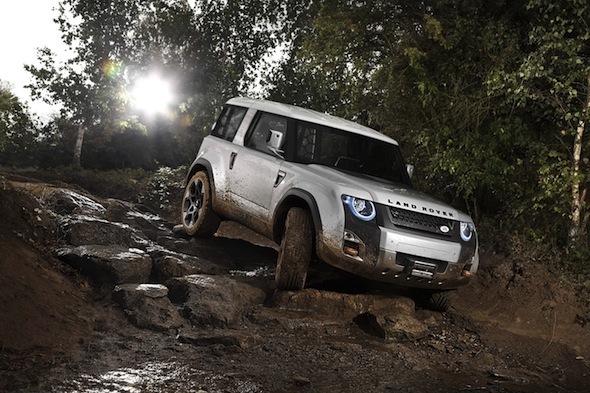 A replacement for the iconic Land Rover Defender is due to be launched in 2016, Autocar magazine reports. Speaking to the motoring weekly earlier this month at the Paris motor show, Jaguar's marketing director, Phil Popham, said the new vehicle would be the most capable ever to wear the Land Rover badge. While the brand has more recently been promoting its luxury Range Rover offerings, the Defender is very important for Land Rover, being a direct descendent of the original 65-year-old Land Rover model - which goes some way to explaining why a replacement version has been such a long time in the making. Autocar confirmed that the styling of the new car has already been signed off, though Land Rover remains tight-lipped on details. Potential styling themes were hinted at in the DC100 concept (pictured above), which was unveiled at the Frankfurt motor show back in 2011. It has not yet been decided when the new model will make its public debut, though an appearance at next year's Geneva or Frankfurt motor shows is likely. Autocar also reports that the new Defender model will be available with Jaguar Land Rover's new range of 'Ingenium' four-cylinder petrol and diesel engines, which will make their debut in the Jaguar XE saloon. Six-cylinder motors are also likely to be offered, with all being mated to eight and nine-speed automatic transmissions as standard. Unlike its more upmarket stablemates, the Defender has been designed to work in some of the world's most inhospitable conditions. As such, it will share wheel and tyre sizes with 4x4s currently found in such places, like the Toyota Land Cruiser, making it easier for owners to source components. However, as Land Rover is pitching the new Defender as 'premium durability', it is expected to have a plusher cabin than its Toyota rival, aimed at increasing its appeal amongst urban motorists.